New Testament scholars continue to spread misinformation about Mark 16:9-20. The latest perpetrator is Dr. Zachary Cole, a professor at Union Theological College. Dr. Cole received his master’s degree from Dallas Theological Seminary and his Ph.D. is from the University of Edinburgh. Nevertheless – or perhaps one should say “Consequently” – he has not been well-informed about the last 12 verses of Mark. ● Justin refers to the inability of enemies of Christians to do them real harm (cf. Mark 16:18). This summary of the activities of the apostles after the resurrection does not contain any precise and direct quotation of the Gospels; however, when Justin writes “And afterwards, when he had risen from the dead and appeared to them” – in Greek, ‛Υστερων δε, εκ νεκρων ανασταντος και οφθεντος αυτοις – this bear a close resemblance to the text of Mark 16:14 as preserved in Codex Alexandrinus: ‛Υστερων δε ανακειμένοις αυτοις τοις ενδεκα εφανερώθη, και ωνείδισεν την απιστείαν αυτων και σκληροκαρδίαν ότι τοις θεασμένοις αυτον εγηγερμενον εκ νεκρων ουκ επίστευσαν. The significance of this correspondence increases when it is noticed that Matthew, Luke, and John tend to use other terms to describe Jesus’ appearance on the first day of the week. (2) Tatian. In the 170s, Tatian, a student of Justin, made a composition called the Diatessaron. It consisted of the contents of the four Gospels rearranged as one continuous narrative, in more or less chronological order. In later generations, Tatian was widely regarded as a heretic (although a case might be made that he was merely very ascetic), and his writings were either destroyed or allowed to rot away; as a result we do not have any copies of the Diatessaron in Greek or Syriac today, even though hundreds of copies once existed. Two of the most important witnesses to the arrangement of the text in Tatian’s Diatessaron are the Gospels-text of Codex Fuldensis (an important Latin manuscript made in 546) and the Arabic Diatessaron (produced in 1043 by a copyist who stated in a note that he was translating from a manuscript of the Syriac text of the Diatessaron which had been made in 873). The Latin Gospels-text in Codex Fuldensis represents, in terms of its verbiage, the Vulgate. Similarly, the Syriac Gospels-text in the Arabic Diatessaron has been conformed to the Peshitta. (The reason for this, presumably, is that the scribes were suspicious of Tatian’s wording, but were willing to perpetuate his harmonization-work.) For this reason, neither of these two sources, standing on its own, is a safe guide on which to base a reconstruction of the wording of the Diatessaron as made by Tatian. When they stand in agreement, however, as flagship representatives of a geographically Western transmission-branch and of a geographically Eastern transmission-branch, their combined testimony strongly indicates the arrangement in which Tatian blended together the text of the Gospels. ● Both use Mark 16:12 between Luke 24:11 and 24:13. ● Both use Mark 16:13b between Luke 24:13-35 and part of 24:36. ● Both use Mark 16:14 between Matthew 28:17 and 28:18. ● Both use Mark 16:15 between Matthew 28:18 and 28:19. ● Both use “and sat down at the right hand of God” (from Mark 16:19) between Luke 24:51 and 24:52. There are some differences, too (see for details the article in The Heroic Age), but inasmuch as (a) Mark 16:9-20 was blended with the other Gospels in the transmission-branch that led to Codex Fuldensis, and (b) Mark 16:9-20 was blended with the other Gospels in essentially the same way in the transmission-branch that led to the Arabic Diatessaron, the conclusion that Mark 16:9-20 was in the source of both branches seems irresistible. (3) Irenaeus. In the course of his writings, Irenaeus – a prolific and prominent bishop in the second century – mentions that as a youth growing up in Asia Minor, he had heard the voice of Polycarp, who had heard John. As an adult, Irenaeus moved to the city of Lugdunum (Lyons), where he served as bishop. He also visited Rome in 177. In Book Three of Against Heresies, chapter 10, (written around the year 180) Irenaeus says: “Also, towards the conclusion of his Gospel, Mark says: ‘So then, after the Lord Jesus had spoken to them, He was received up into heaven, and sits on the right hand of God.’” This plainly shows that in the manuscripts of Mark that Irenaeus read, around 150 years before Codex Vaticanus was produced, Mark 16:9-20 was part of the text of the Gospel of Mark. ● In Epistula Apostolorum, the apostles are depicted rejecting a woman’s claim that she had seen the risen Jesus, something that occurs in the Gospels only in Mark 16:10-11. ● In Epistula Apostolorum, Jesus is pictured saying to the apostles, “Go ye and preach to the twelve tribes, and preach also to the heathen, and to all the land of Israel from the east to the west and from the south unto the north, and many shall believe on <me> the Son of God.” “Go ye and preach” is reminiscent of Mark 16:15. ● In Epistula Apostolorum, Jesus rebukes the disciples by saying, “You are yet slow of heart,” which resembles the rebuke of their hard-heartedness described in Mark 16:14. ● In Epistula Apostolorum, Jesus says to the disciples, “Whoever shall hear you and believe on Me shall receive from you the light of the seal through Me, and baptism through Me,” and, “They shall receive the baptism of life and the remission of their sins at My hand through you,” which conveys the sentiment of Mark 16:16, mentioning belief and baptism together. While these are small points, their cumulative impact confirms that the author of Epistula Apostolorum recollected the contents of Mark 16:9-20. Although Hierocles’ quotation is inexact, it shows that his manuscripts of the Gospels, extant in 305, contained Mark 16:18 – unless this part of Hierocles’ work is just an extract from the work of Porphyry, in which case the quotation echoes manuscripts from the 270s or earlier. 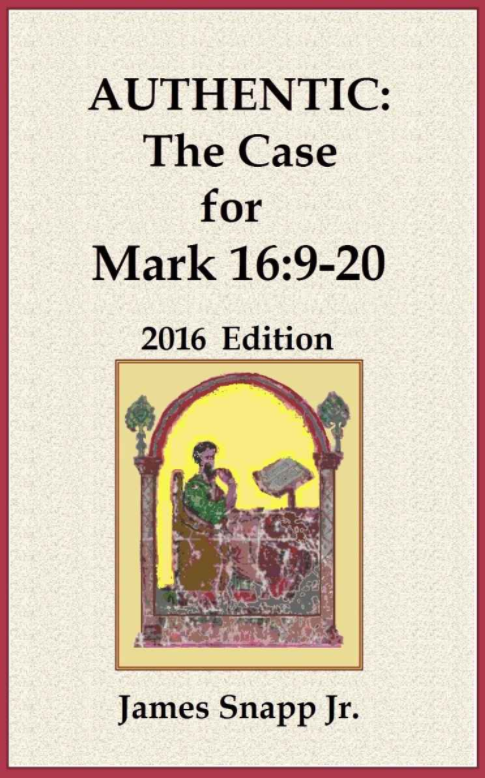 My e-book on Mark 16:9-20. In the interest of brevity I shall not go into detail about the evidence from Tertullian, Hippolytus, De Rebaptismate, Vincentius of Thibaris, Acts of Pilate, and other sources; the data can be found in Authentic: The Case for Mark 16:9-20. The testimony of Justin, Tatian, Epistula Apostolum, Irenaeus, Hierocles, and Aphraates (representing different locales) is sufficient to demonstrate that Mark 16:9-20 was widely used as Scripture in the early church. Now then: Aphrahat was a contemporary of the copyists who made Vaticanus and Sinaiticus. The other six patristic witnesses pre-date Vaticanus and Sinaiticus, and in the case of Justin, Tatian, Epistula Apostolorum, and Irenaeus, the contest is not close; their testimony is over a century earlier. Inasmuch as Dr. Cole says that manuscripts such as Alexandrinus, Bezae, Codex W, and hundreds of medieval manuscripts of Mark “are really secondary in importance because they stand farther away from the event itself,” what happens when that line of reasoning is applied to Vaticanus and Sinaiticus when they are compared to the testimony of Justin, Tatian, Epistula Apostolorum, and Irenaeus? Logic would seem to compel the conclusion that Vaticanus and Sinaiticus are roughly equal in weight with the combined testimony of Hierocles and Aphrahat, and really secondary in importance when compared to Justin, Tatian, Epistula Apostolorum, and Irenaeus. He is referring to the greater age of Vaticanus and Sinaiticus compared to the manuscripts that include the passage. But Hierocles and Aphrahat are just as close to the event itself as Vaticanus and Sinaiticus. (A little closer, actually.) Will Dr. Cole admit therefore that Hierocles and Aphrahat are just as close to the event as Vaticanus and Sinaiticus? Will he concede now that Vaticanus and Sinaiticus are really secondary in importance, when compared to Justin, Tatian, Epistula Apostolorum, and Irenaeus, because those two manuscripts stand farther away from the event itself? Your move, professor. There are other problematic claims in Dr. Cole’s recent essay but I will stop here for now – almost. Just two more things. First, it should never be overlooked (although practically all commentators do, and certainly all Bible footnote-writers do) that while Vaticanus and Sinaiticus attest to the non-inclusion of Mark 16:9-20, they both have unusual features that reveal their copyists’ awareness of the absent verses. I have explained this in two previous posts: Codex Vaticanus and the Ending of Mark and Codex Sinaiticus and the Ending of Mark. Second, Dr. Cole describes Vaticanus and Sinaiticus are “our earliest and best copies of Mark’s Gospel” but this must be qualified and clarified. 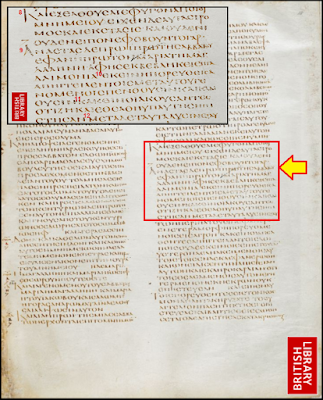 Vaticanus and Sinaiticus are indeed our earliest manuscripts, but it is obvious that Irenaeus and other early patristic writers possessed earlier manuscripts which included Mark 16:9-20. Their manuscripts were not kept in Egypt, (where the climate was more favorable to papyrus-preservation), but that is not a valid reason to ignore them as Dr. Cole has done (for in his essay he completely avoided the patristic evidence). As for Vaticanus and Sinaiticus being the “best copies”: suppose someone said, “My two ships are the best of all ships,” but you noticed that although their hulls were far above average quality at many points, each had two gaping holes in the stern. Would you still call those the best ships? Arguing for a reading because it is found in “the most reliable manuscripts” or “the best manuscripts” is like arguing that the New England Patriots must have won a specific football game because the New England Patriots win more football games than other teams. "This second-century composition by an unknown author is little-know now"
Do you think Dr. Cole is too influenced by Dr. Wallace's view, and therefore would not read the evidence in the same manner as you? I have no way to gauge the effects of DTM text-critical training on Dr. Cole's views, but it is possible that Dr. Wallace's erroneous claims related to the ending of Mark (just search for "Wallace" here at the blog and see what comes up) had an effect. I am however more interested in the cure than the cause. It appears that Zachary Cole's father may pastor the church whose website hosted his article. 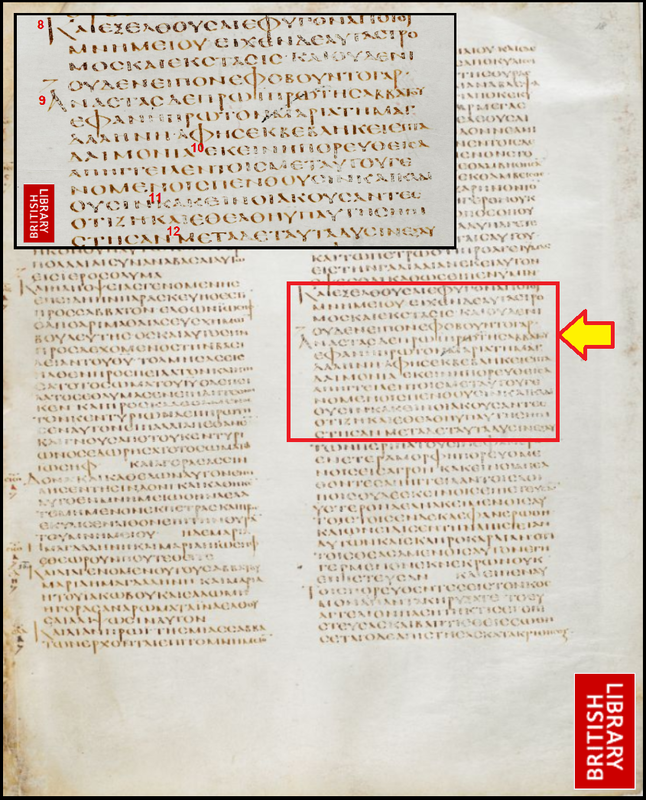 The evidence you present, epsecially Irenaeus, shows that the longer ending mss. were out there and rather early. Thanks for the contributions you make to textual criticism. Always insightful and carefully researched. God bless!